Laws vary between jurisdictions, but generally agree on the distinction between manslaughter and murder. Manslaughter is killing, voluntary or involuntary, in the course of other activities done recklessly. Murder involves premeditation. It is a deliberate activity, with a specific purpose, not simply a byproduct of another. What's the B2B Marketing point of the distinction? Recent MarketingProfs (@MarketingProfs) research, published in conjunction with LinkedIn and the Content Marketing Institute reveals one incontrovertible fact which proves that premeditation and deliberation are key to success. 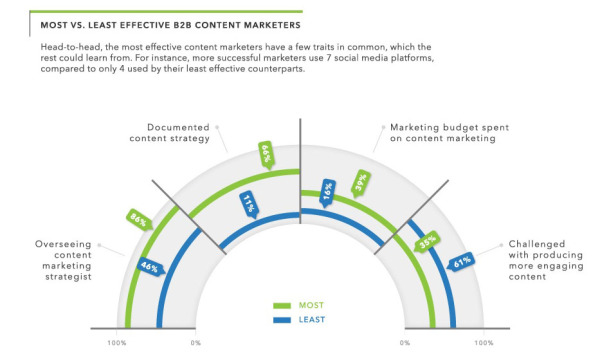 Directly comparing most vs. least effective content marketing programs, the research found a number of areas of differentiation between different programs. You'll find the entire infographic below. It's worth spending a few minutes to digest. But the most critical factors are evident in this block. Two factors (shown on the left) have the most profound effect on the success of an inbound marketing initiative. And they both have to do with strategy. Having a documented strategy, and having someone actually in charge of the program and executing that strategy, go further than anything besides senior management buy-in and support. B2B inbound marketing success isn't going to happen by accident. You're not going to manslaughter your way to business growth. You can't create a few social media accounts, create a blog to post semi-annual press releases, or put the intern (you know the one that is a natural with Instagram?) in charge of your content marketing merely because they have more technical aptitude than you. Just as you wouldn't leave your R&D and product roadmap to chance, you can't fumble your way through effective content marketing. And while there's value in identifying the distinction between having a strategy and having someone to oversee it's execution, they both point to the same root issue. The companies that succeed with inbound marketing are the ones who embrace it as a core activity - not simply as a tweak around the edges. Frustrated that it's getting harder and harder to find new customers? Tired of dumping money into the latest new internet marketing fad without seeing results? Are you ready to take a cold blooded, analytical & premeditated stab at it for your business? The reason most companies don't have a guiding inbound marketing strategy is specifically because they don't have the overseeing talent in house. This is a rapidly evolving discipline. Your in-house team may well have familiarity, but hardly state of the art forensics tools or training. Let them coordinate, but draw on outside experts to help create and oversee the strategy. And download your Step by Step Guide to Internet Marketing here.